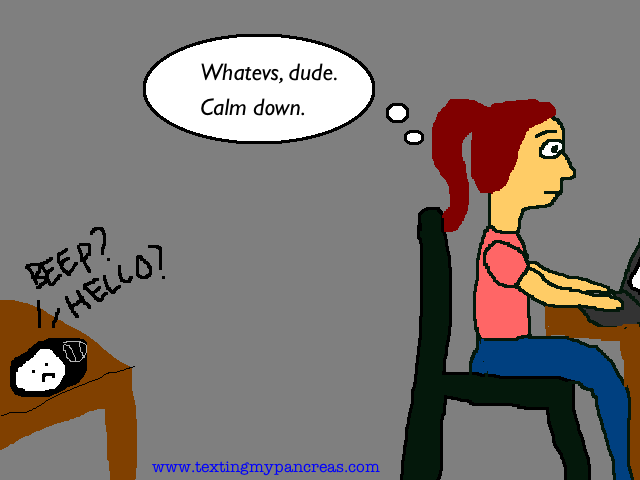 Texting My Pancreas: The Seven Evolutionary Phases of My CGM Ownership. The Seven Evolutionary Phases of My CGM Ownership. 6. 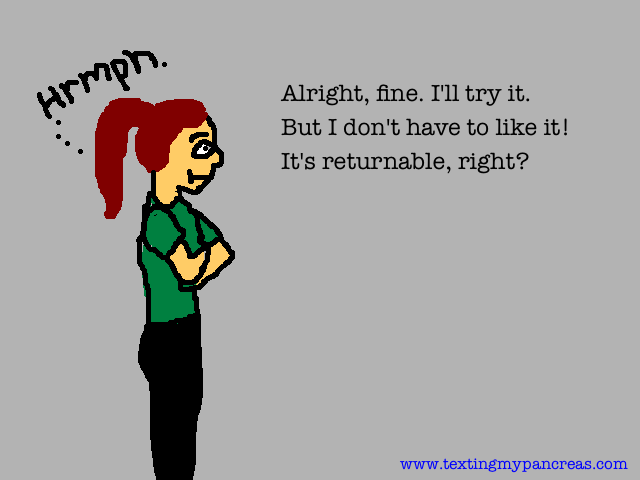 Annoyance (and dwindling patience). dying, DYING laughing reading this! hilarious! 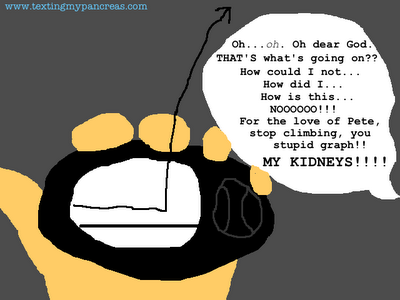 #6 Made me think of part of my appointment with my endo last week. 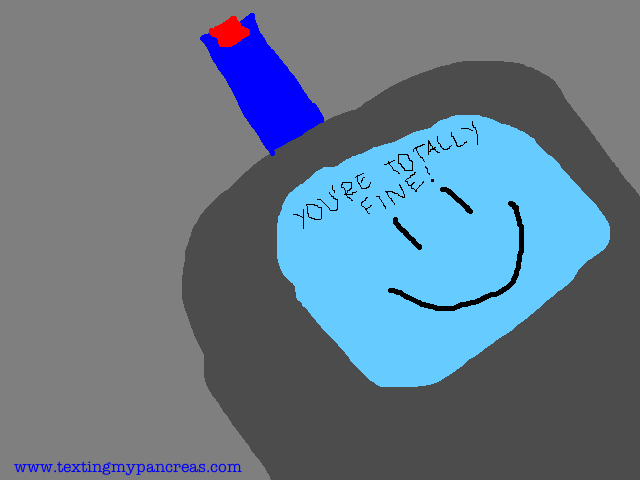 She was looking at the Dexcom graphs I'd printed out and was asking about the highs, and I pointed out that when I *am* high, Dexcom always thinks I'm *far* higher than I actually am. So when she was making notes on my chart and she wanted to put this down as a reminder for herself next time, she mumbled, "When blood sugar ises, Dexcom... um... loses it's place?" And I said, "The way I like to put it is: Dexcom panics." She immediately burst out laughing and was like, "I'm going to remember that one!" I am printing this and hanging on the wall. Amazing. This is totally wickedly AWESOME!!!! 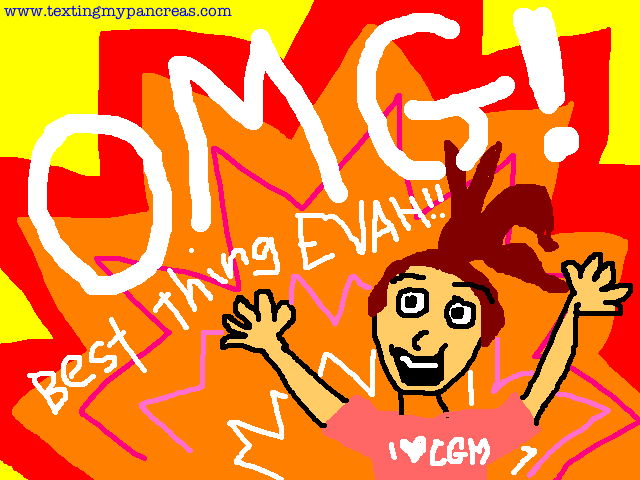 Love it, and so laughing my CGM off. Particularly the happy meter telling that you're actually fine, not dying, as CGM displays. Great job on the storyboards, Kim! 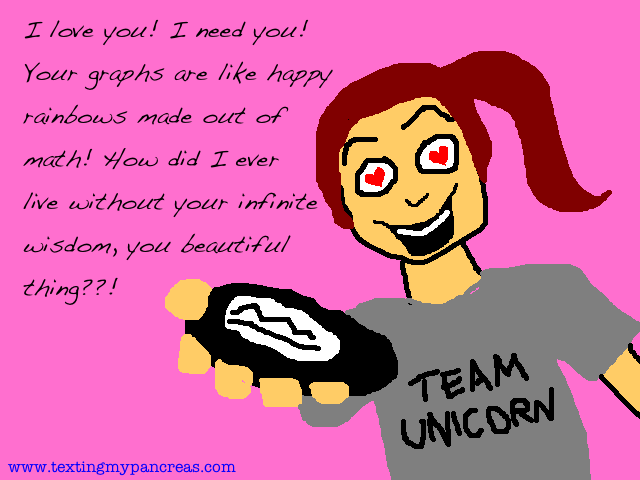 LOL I love the Team Unicorn shirt. THIS IS AWESOME! So totally how I feel about my CGM. If it weren't for this pregnancy, I swear it may be in a drawer somewhere most days. lol, hilarious, thanks for the great laughs. That is so funny because we all now it is SO TRUE!!! This is so funny, and SO true! Love it!! I can't stop smiling..it's just perfect! Funny comic, but I can't help but think that if this continuous meter were attached to an insulin pump you'd be in a coma several times due to overdosing on insulin, thanks to the erroneously high sugar results. Seems like a death trap to me. 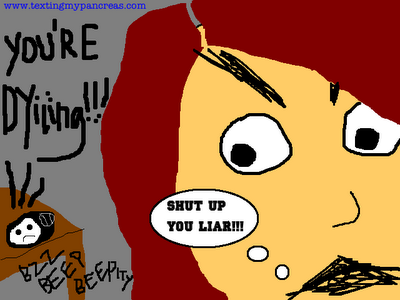 Why use such an unreliable device? Imagine if your car's speed gauge were off by a factor of two? How many tickets / accidents you'd get. Thanks for the comment, and you bring up a good point about accuracy. The Dexcom isn't as ferociously inaccurate as I've depicted it to be here (just as I normally don't have rainbows shooting out from behind me, either), but you're right that CGMs as they exist now are not at an acceptable level accuracy-wise for blind integration with insulin pump functionality. I'm looking forward to the day when they are - but until then, this will have to be "good enough", you know? Love this! 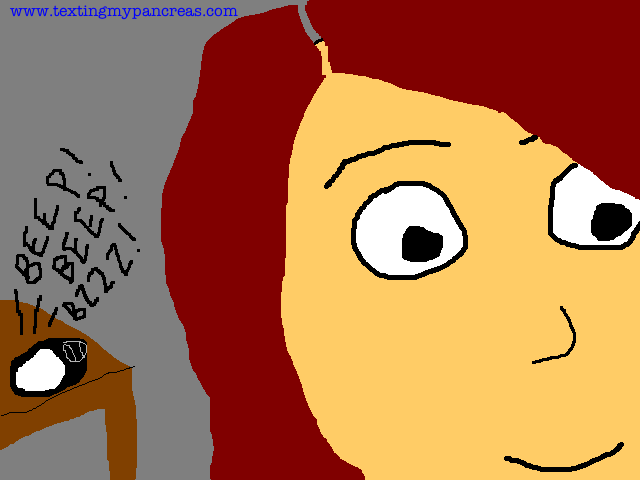 I'm at "meh" and have been to known to respond to a low alarm shrieking while I'm ingesting a low treatment with "STFU, I'm feeding you, back off or you're going in the drawer." Oh My Lord. This is soooo funny! And SO TRUE! My favorite part is the "happy rainbows made out of math"!! LOVE THIS! HAHAHAHAHAHA!!! Love this...AND...SO, incredibly true. But I'm only at step 4 now... Can't I just stay here? 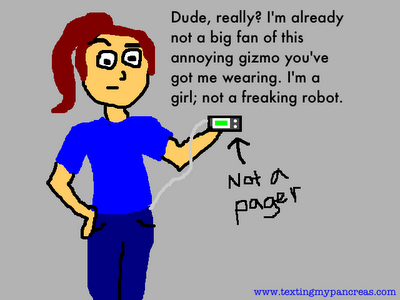 I just peed my pants a little bit with the comic of the girl in the Team Unicorn shirt holding the shiny new Dexcom. This is awesome!!!! EXACTLY! Just don't forget the story of the boy who cried wolf. I've ignored mine after it had been acting up, only to find out it was no longer misbehaving and I was actually low. This is the best thing ever. This was great, and so true! My minimed CGM is in the drawer of late, but DEX may be next. 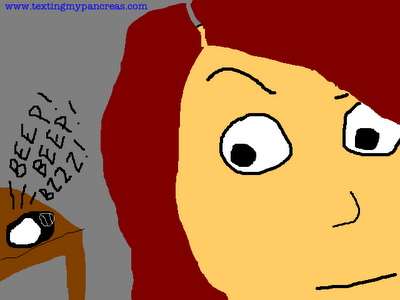 The Inadvertent Advantages of Having Diabetes. DOC in DC: Part Four. DOC in DC: Part Two. DOC in DC: Part One. Guest Post: Oh, The Weather Outside Is Frightful. Guest Post: I Always Overpack. Advocating for the DOC... in D.C.